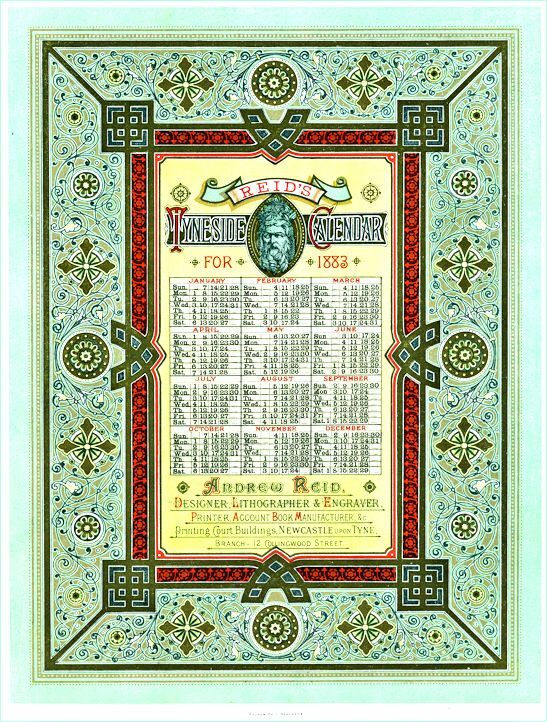 Andrew Reid, born in 1823, was one of the sons of David Reid of the well-known firm of Reid & Sons, jewellers, Newcastle-on-Tyne. After leaving school he was apprenticed to Mark Lambert who had been an apprentice and pupil of Thomas Berwick, the wood engraver. Mark Lambert commenced business in Newcastle in 1807, as an engraver on copperplate and silver. By 1838 together with his son Mark William, his business was trading as "M. & M. W. Lambert" the firm attaining a good name for the quality of its work. Associated thus with the best artistic traditions of the town, Andrew Reid, after completing his term of seven years' apprenticeship with the Lamberts, went to London to gain experience in lithography and general printing in the establishment of Day & Son, later to become Vincent Brooks, Day & Son. Returning eighteen months later as a young man of twenty-two he started his own business in 1845 as an engraver on silver & copper, soon expanding into general printing, bookbinding and lithography. This was the beginning of an enterprise that was to become one of the major players in the printing industry of the North East. In 1890 Andrew Reid had the opportunity to acquire Lambert & Company, the apprentice now becoming the proprietor of his master's business. A few years later it was registered as a limited company under the title "Andrew Reid & Company Limited" and continued to flourish well into the twentieth century eventually merging with Hindson Print which in 2013 became part of Elanders Print UK.